TRIM5 is a potent retrovirus inhibitor that targets viruses bearing particular capsid (CA) residues. In most primate species, retroviral restriction requires the C-terminal SPRY domain unique to the α-isoform of TRIM5, but the mechanism by which susceptible viruses are recognized and targeted for restriction is unknown. Here we show that TRIM5α binds retroviral CA from detergent-stripped virions in a SPRY-dependent manner with sufficient discrimination to account for the exquisite specificity of restriction. Two independent screens identified TRIM5 as a potent retrovirus restriction element that targets select viruses after entry into primate cells [1, 2]. The biochemical basis for specificity of restriction is only evident in cells of the owl monkey where HIV-1 CA is recognized by the C-terminal cyclophilin domain that is unique to the TRIM5 orthologue found in this genus [2–4]. In all other primates, including humans and macaques, potent CA-specific restriction is conferred by the TRIM5α isoform [1, 5–9], which possesses a C-terminal SPRY domain . The mechanism by which TRIM5α selects retroviruses bearing particular CAs for restriction is unknown, though the TRIM5α SPRY domain is required for restriction and variation in SPRY amino acid residues determines the CA-specificity of given TRIM5α orthologues [9, 11–13]. Conventional biochemical and two-hybid experiments failed to detect an interaction between TRIM5α and CA (SS and JL, unpublished data). The observation that non-infectious virus-like particles saturate TRIM5α-mediated restriction , but only if the particles bear a mature core from a restriction-sensitive virus [15, 16] suggests that the TRIM5α SPRY domain recognizes a complex structure unique to the core of susceptible virions. Consistent with this model, expression within target cells of gag, gag-pol, or gag fragments encoding CA, CA-NC, or ubiquitin-CA-NC fusions, failed to block restriction activity (David Sayah and JL, unpublished data). Retrovirion cores can be liberated from the viral membrane envelope by detergent . HIV-1 virion cores were prepared with several different detergents and mixed with recombinant TRIM5 orthologues. After TRIM5 enrichment by affinity chromatography, CA associated with owl monkey TRIMCypA, as reported with other methods [3, 4], but not with the equally potent HIV-1 restriction factor rhesus macaque TRIM5α (SS and JL, unpublished data). We then selected murine leukemia virus (MLV) for study because, relative to HIV-1, MLV CA remains tightly associated with viral reverse transcription (RT) and preintegration complexes [18, 19]. 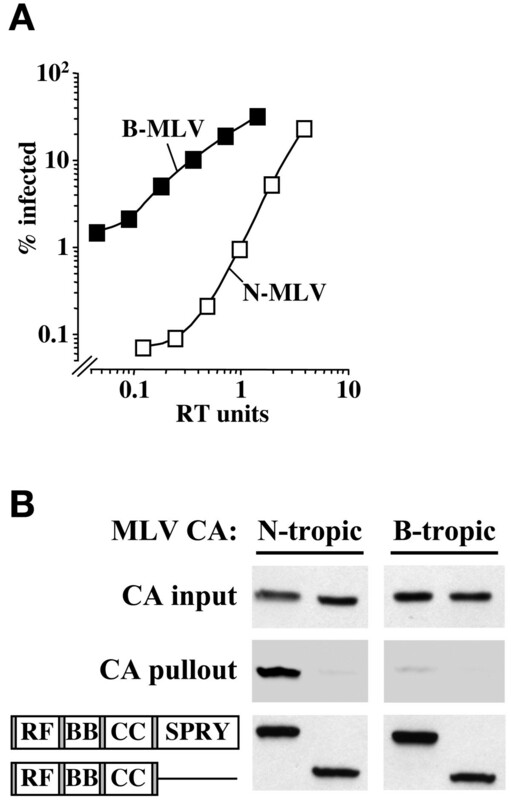 MLV strains bearing an arginine at CA residue 110 (so-called N-MLV) are highly susceptible to restriction by human TRIM5α whereas MLV virions bearing glutamate in this position (B-MLV) are completely resistant to restriction [5–8]. VSV G-pseudotyped N- and B-tropic MLV virions were produced as previously described  and, after normalization on non-restrictive Mus dunni cells, N-MLV was roughly 100-fold less infectious than B-MLV on HeLa cells (Figure 1A). Full-length human TRIM5α was then produced as a GST-fusion protein in 293T cells and mixed with purified N-MLV virions. CAp30, the major MLV core protein constituent, associated with TRIM5α (Figure 1B). CAp30 from B-MLV virions did not associate with TRIM5α (Figure 1B) demonstrating that TRIM5α binding was specific for restriction-sensitive CA. CAp30 did not associate with TRIM5 lacking the SPRY domain (Figure 1B), indicating that the SPRY-domain is required for CA-recognition. Human TRIM5α binds CA from restricted MLV virions. (A) HeLa cells were infected with VSV G-pseudotyped, N- and B-tropic MLV-GFP vectors after normalization for RT activity and infectivity on non-restrictive Mus dunni tail fibroblasts. The percentage of infected (GFP-positive) cells was determined by flow cytometry. (B) 293T cells were transfected with plasmids encoding glutathione S-transferase (GST) fusions with full-length TRIM5α or with TRIM5 lacking the SPRY domain. Cells were lysed (50 mM Tris pH 8.0, 150 mM NaCl, 1% NP-40, 0.1% SDS) and mixed for 2 hrs at 4°C with virions (N-MLV or B-MLV) that had been concentrated by acceleration through 25% sucrose. GST fusions and associated proteins were enriched on glutathione-sepharose beads and immunoblotted with goat anti-MLV CA antibody (CA pull-out), or anti-GST antibody (bottom panel). Unbound CA remaining in the binding reaction was probed with anti-MLV CA antibody (CA input). TRIM5 protein domains fused to GST are indicated schematically on the bottom left: RF, ring finger; BB, B box; CC, coiled-coil. Retroviral restriction specificity thus seems to be determined by TRIM5α binding to CA in a process that requires the SPRY domain. The fact that TRIM5α recognized retroviral CA presented by detergent-stripped virion cores, but not free CA protein, suggests that the SPRY domain recognizes a complex surface of multimerized CA. Once cores of restriction-sensitive viruses are singled out by the SPRY domain, TRIM5α blocks retroviral RT  by a mechanism that awaits elucidation. Our findings bring us one step closer to understanding how the potent antiviral activity of TRIM5α might be harnessed to block HIV-1 infection in people. This work was supported by NIH grant AI 36199 to J.L. SS and JL conceived the experiments and wrote the manuscript. SS performed the laboratory work. Both authors read and approved the final manuscript.